For a while now, I’ve been looking for a replacement for my ancient 50 MHz Hitachi analog scope. This scope has served me well for the 10+ years I’ve owned it, but it’s kind of a junker. Slow, out of calibration, flaky triggers… I’d could probably get a similar scope for about $15 on eBay. As much as I love the instant response and tactile feel of analog scopes, I’ve been doing several projects lately that really could benefit from a digital scope and a logic analyzer. I’ve frustrated myself for hours trying to capture one-shot signals with my analog scope, when a digital scope would have made the job a piece of cake. So, I finally bought a Bitscope BS100U. 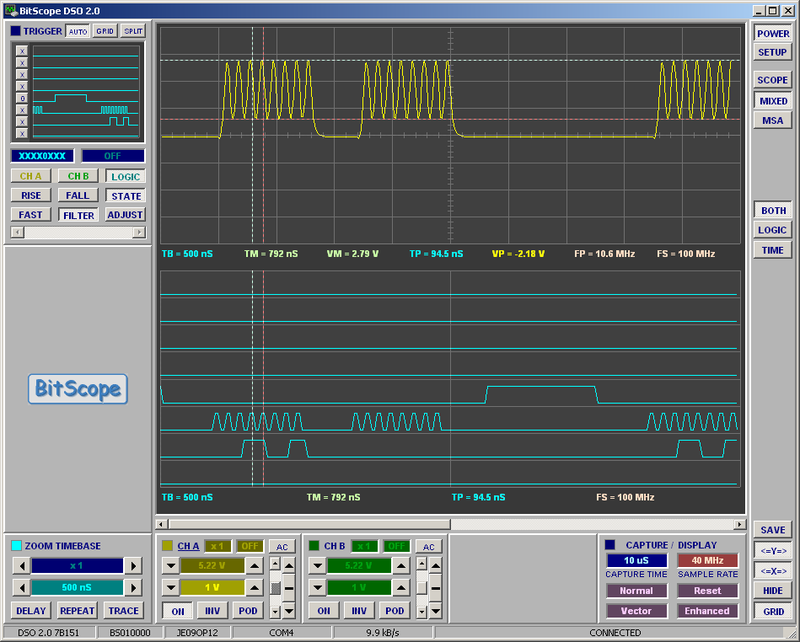 It’s a PC-based oscilloscope. I was initially really skeptical about PC-based scopes, but they do have a few big advantages: They don’t hog desk space, it’s easy to export data to your own tools or capture screenshots for the web, and they tend to be cheaper than a standalone DSO with similar features. Best of all, the Bitscope is a mixed-signal scope. The BS100U has two analog inputs and eight digital inputs. I’ll still need to pull out my homebrew “Saxoscope” for high-speed continuous logic capture, but the Bitscope’s MSO mode should be more than sufficient for day-to-day use. Pros: Small, opto-isolated, mixed-signal, easy to set up, good build quality, fairly powerful software, open design, cheaper than a Tektronix digital scope. Cons: Kind of slow, software UI is pretty odd, more expensive than some competing PC-based scopes ($595 without any probes/pods). Bitscope web site is very rarely updated. This entry was posted in Technology and tagged oscilloscope, tools on August 4, 2008 by Micah.